Laser Gold® and Oscar® Help James Webb Keep His Cool - EPNER TECHNOLOGY INC.
Two years ago, on titanium components for NIRCam, one of two cameras aboard the James Webb Space Telescope, engineers at Lockheed Space Systems specified Laser Gold, an electroplating process developed by our NY plating firm, Epner Technology, (founded by my father in 1910, under the name Cohan-Epner). The goal was to lower the thermal load on the camera components utilizing the ultra-high IR reflectivity, (low emissivity), of this unique plating process. But the Jet Propulsion Lab could not risk specifying Laser Gold without having proof that the emissivity was indeed the .02 that Epner had been advertising. Further, it had to be proven that the adhesion of the plating could withstand bending “like a pretzel” without delamination of the Laser Gold. This was particularly important to a Goddard engineer, John Gygax, who had a sad previous experience with a gold coating that peeled off. Therefore, the first test was for adhesion of the plating. A three-foot length of the tubing was plated by Epner to the required specification and then Gygax, repeatedly, over a very tight radius, bent and unbent the test section and then baked it at 350 C. The adhesion was unaffected by this brutal test. After clearing that hurdle, the emissivity determination was next. 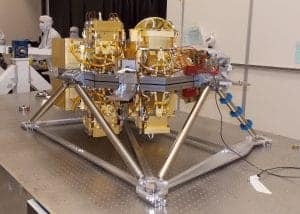 To accomplish that, NASA funded a team at Goddard Space Flight Center, headed up by James Tuttle, to empirically determine the thermal performance of the Laser Gold coating. The data proved that Epner’s claims might have even been a bit conservative. See the link to Tuttle’s experiment below. Comfortable that Laser Gold would meet the mission requirements, and since it would have been impractical to polish it in its final configuration which was a coil, (aka “Slinky,” named after the “walking” coiled spring toy), a straight length of some twenty feet of the flight tubing was sent to Epner for pre-polishing, returned to JPL for shaping into the Slinky coil, and then another cross-country trip for the final Laser Gold plating. This entry was posted in Uncategorized on May 1, 2017 by David Epner.